Social Media Beta Test FAQs - There's Still Time to Sign Up! This week, during our regular monthly PFI standards committee conference call we learned that a revised New Source Performance Standard (NSPS) had been submitted to the Office of Management and Budget for review. This step suggests that the publication of the new rule is imminent and I'm happy to report that our standards committee and board are already at work anticipating how the new rule will treat pellet fuels and the certification programs available to wood pellet producers, including the PFI Standards Program. While the details of the program are not known, industry observers and those familiar with the EPA under the Trump administration anticipate that the new rule will have a lighter regulatory touch. One thing I have learned in my tenure as the Executive Director of the PFI is that air quality and the protection of air quality is not simply the jurisdiction of the EPA. This is particularly important with regard to the new NSPS rule currently under review at the OMB as our contacts at state level air regulatory agencies have made it clear that if the new NSPS rule does not guarantee that they will be able to meet their air quality targets, individual states will have to pursue state-specific regulations which may include rules and regulations regarding the fuel you all produce. Clearly, navigating a patchwork of varied state-level fuel requirements is not optimal for producers producing for and selling into multi-state regions. During our call this week our committee decided that as we move through this new rule publication and comment period our internal discussions as a board and a standards committee need to occur with greater frequency than simply our standard monthly call. Our team and committee will continue to monitor this important piece of federal regulation and share important information regarding the new rule as it becomes available. 3. Will my brand has a presence on any of the sponsored ads? Our ultimate goal is to promote the sales of pellet appliances, making progress toward Operation 100K. We'll measure success in several ways - a number of people reached, engagement with our ads, and retailer leads. If we are able to replicate our initial test from this summer in each of the selected markets, we will reach 250,000 or more social media users. We will also ask our retailers to keep track of how many leads they get from Facebook or Instagram and to report these numbers. We're building a collection of photos of our members, their pellets mills, and product. Send them to Carrie Annand at [email protected]. 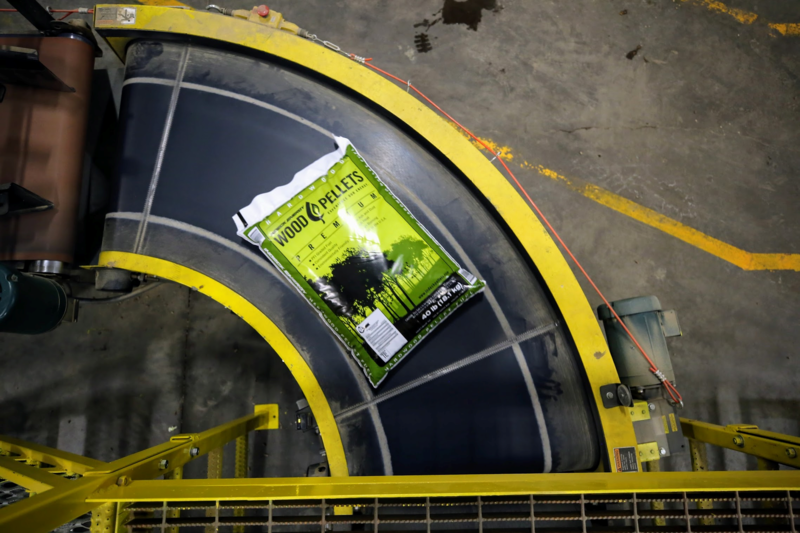 As we're gearing up for pellet season, this week's featured photo shows fresh bags off coming off the Indeck production line in Ladysmith, Wisconsin. Don't miss the opportunity to sponsor PFI to reap the benefits for the rest of the year! Sponsorship at all levels brings many perks, along with exposure for your company to the pellet fuels industry. By signing up to sponsor the association in 2018, you will reap the benefits throughout the coming year. For people who love outdoor cooking, the variety of gas and charcoal grills has never been better. Mike Zamora, store director at Barbeques Galore in Henderson, said what it basically comes down to is what type of cooking a person wants to do and how much time he or she plans to spend preparing a meal. A single guy would probably be happy with a traditional propane gas grill on a cart to flip his burgers, hot dogs and the occasional steak. But with the growing popularity of cooking shows dominating the airwaves and celebrity chefs opening their own restaurants, more and more people are becoming foodies. They want to emulate what they see on cooking networks and are demanding the professional tools to achieve what their taste buds are craving. More than 30 organizations, including the Biomass Thermal Energy Council, Alliance for Green Heat and Pellet Fuels Institute, sent a letter to leaders of the Senate Agriculture Committee on Aug. 17 urging the Senate to expand the Community Wood Energy and Innovations Program in the final version of the Farm Bill. The U.S. House passed its version of the 2018 Farm Bill on June 21. That legislation included an expansion of the CWEIP. One week later, on June 28, the U.S. Senate passed its version of the 2018 Farm Bill. The Senate version, however, did not include an expansion of the CWEIP. The legislation will soon head to conference committee where members of the House and Senate will resolve differences between the two versions of the bill. Within the letter, the BTEC and other groups noted that language in the House version of the Farm Bill would expand the CWEIP into a "more robust competitive nationwide grant program administered by the USDA Forest Service, with a $25 million annual authorization, for community-scale wood energy and value-added forest products projects." The USDA's Rural Business-Cooperative Service is soliciting fiscal year 2019 applications for the Rural Energy for America Program, which helps agricultural producers and rural small businesses install renewable energy systems and make energy efficiency improvements. REAP offers two types of funding assistance. Under the first, Renewable Energy Systems and Energy Efficiency Improvement Assistance, the USDA provides grants and guaranteed loans to agricultural producers and rural small businesses to purchase and install renewable energy systems and make energy efficiency improvements. Eligible renewable energy systems are biomass, including anaerobic digesters, wind, solar, small-hydo-electric, ocean, geothermal or hydrogen derived from renewable resources. The second is the Energy Audit and Renewable Energy Development Assistance Grant, which is available to state, Tribal or local governments; institutions of higher education; rural electric cooperatives; public power entities; and councils. Recipients of the grants establish programs to assist agricultural producers and rural small businesses with evaluating the energy efficiency and the potential to incorporate renewable energy technologies into their operations.